Bannon was referring to the Bush presidents attacking President Donald Trump in a new book, The Last Republicans: Inside the Extraordinary Relationship Between George H.W. Bush and George W. Bush by historian Mark Updegrove. “Listen, I try to be bad cop to President Trump’s good cop. He’s head of the Republican Party. He tries to stay above the fray. Hopefully I’m there to do the dirty work as his wingman,” Bannon said. “What are we talking about? This party is a party made up of workers. It’s made up of American workers. It’s made of the American middle class. It’s got to represent not just their values, but their interests, and it doesn’t. The donors, the conservative consultants, the lobbyists, and the politicians they bought in the Republican Party don’t represent their interests at all. It’s quite shocking,” he contended. “I think now with the Internet and news services like Breitbart, the Daily Caller, and others you’ve disintermediated the kind of old think tanks of the conservative movement, and you’ve disintermediated the old media companies – including Fox News to a large extent, which is really quite Establishment. I think you just have this energy at the grassroots level that really wants to take its party back, and by taking its party back, really effectuate change in the United States. I think it’s healthy, and I think it’s great,” he said. “Look, it’s all about elections. If you’ve got a better idea and a better candidate, you know, throw down and let’s see if you can win,” he invited. Bannon handicapped that hypothetical race as one in which Team Bush would not fare well. “If that’s what they think, then they should move on, because they certainly don’t belong in the Republican Party that reflects the values and the interests of working people, working men and women throughout the country who I couldn’t be prouder come to the pages of Breitbart, and are basically the backbone of the listening audience at Breitbart News Sunday,” said Bannon. Mansour suggested the “thinness and smallness” of the debate within the Republican Party before the advent of Donald Trump and his issues prevented it from making inroads with the working-class electorate. “It says something about Bush that Bush is here attacking, once again attacking President Trump and being just as vitriolic as possible. 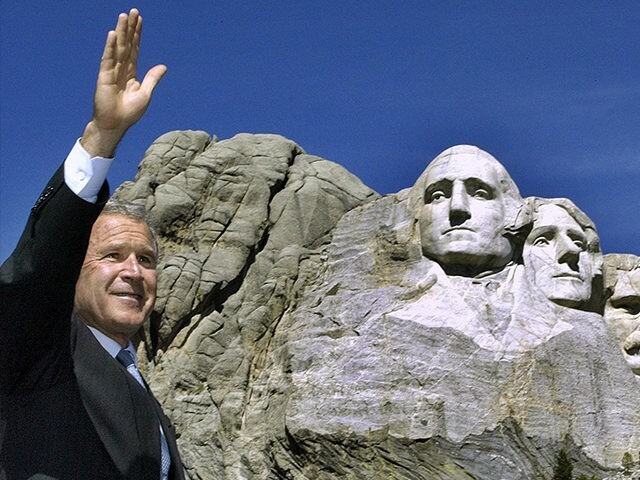 I’ll reiterate this: I think President Bush 43 will go down in history as the single most destructive in the United States – and I include James Buchanan in that, the president before the Civil War,” he asserted. “Now, what do I mean by that? He had three major policy initiatives that virtually destroyed the country. Number One was the Iraq war, $6 trillion in Iraq and Afghanistan, the wars still haven’t been won. Iraq is as big of a disaster as it’s ever been. It’s caused total chaos in the Middle East. And it was either he outright lied to the American people or he’s just totally incompetent and misread what the information was,” he charged. “But the most important part of what he was destructive about is China. It was on his watch they really set in motion Most Favored Nation and getting into the WTO. I know the Clintons pushed that and tried to implement it, but Bush looked at China, the whole Bush administration said China is going to get wealthier, is becoming more democratic, and more free-market capitalist. That was a massive, massive mistake,” he said. “China today is a competitor-slash-enemy, having economic warfare against us, of incalculable power. That started with the Bush administration. He is the single most destructive president in the history of the country, and I include James Buchanan in that. For him to come and attack President Trump is an absolute disgrace,” Bannon concluded.